Rhino hard wearing acrylic line marking paint is an ideal way to create and maintain critical line marking. The Rhino hard wearing acrylic line marking paint is a specially formulated lead-free aerosol paint that expels fully without clogs. The Rhino hard wearing acrylic line marking paint is available in white, yellow, red, blue, orange and green. Black and grey are also available to cover old lines or for mistakes on asphalt or concrete. The Rhino hard wearing acrylic line marking paint has an extensive colour range and a quality assurance of no clogs. The Rhino hard wearing acrylic line marking paint is in stock and can be purchased now at Australian Warehouse Solutions (AWS). 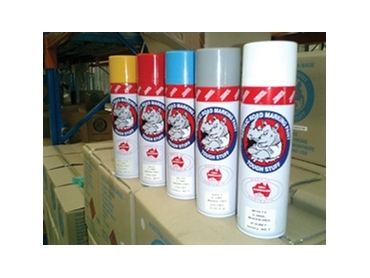 Australian Warehouse Solutions is the exclusive distributor of the Rhino hard wearing acrylic line marking paint.